Making Data Digital with the Internet of Things towards Building a Smart City. Based on a 2014’s U.N. report, 54% of the world’s population are residing in urban areas, and the numbers are expected to rise to 66% by 2050. With Singapore leading the pack with 100% of its population in the urban areas, it is no wonder that this smart city has been the center of attention of global ICT leaders looking to explore the best practices of building smart cities worldwide using Big Data and Internet of Things (IoT). 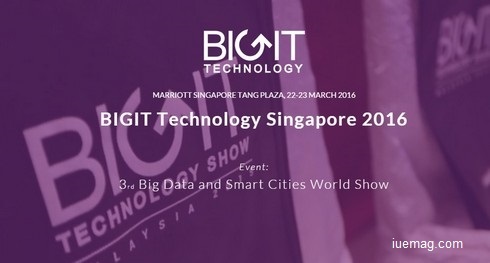 BIGIT, which stands for Big In Technology, is honored to present its BIGIT Technology Singapore 2016 which will be held on 22nd - 23rd March 2016 at Marriott Tang Plaza, Singapore with Cloudera and Marklogic as its Gold Sponsors. This two-day conference with the theme, “Making Data Digital with the Internet of Things towards Building a Smart City” will highlight significant key areas of Big Data and IoT in changing businesses and people’s lives in line with the implementation of Smart Cities. Gain comprehensive learning experience related to Smart Cities with tangible input from renowned senior leaders and experts from all industries across the globe. Build interactive network with global ICT leaders by being involved in the growing and creation of new and existing Smart City markets using Big Data and IoT. Gain various strategies and tools to promote knowledge exchange, develop new partnerships and create business opportunities in the new and growing Smart City markets. Understand what it takes to embrace and instigate Big Data in your own organization. Be in the presence of more than 200 attendees from highly targeted audience including global Big Data & IoT industry leaders who are interested in the technologies and sustainability of Smart Cities. To discuss and identify industry’s best practices to promote strong and prosperous urban policies with global policy makers. Do not miss out on the chance to meet our exclusive group of established sponsors and exhibitors including renowned key players in the industry such as the C-level management, Directors of MNC companies, Strategic Decision Makers with high purchasing power and Key Government Personnel governing the national policy. Olygen is an event organiser and one of its brands – BIGIT, has a successful track record of a series of events, ie: Big Data World Show (2013 - 2015), Internet of Things (IoT) World Show 2015 among others. BIGIT has since been creating a one-stop platform for Fortune 500 companies to network, gather and acquire latest insights on Big Data and IoT, making our shows – especially Malaysia, the Leading Big Data Show in Asia as recognised by industry experts. BIGIT’s large-scale events are region-wide including major cities such as Singapore, Kuala Lumpur, Hong Kong, Bangkok, Shanghai, Jakarta, Dubai, Doha, Abu Dhabi and Johannesburg. Any facts, figures or references stated here are made by the author & don't reflect the endorsement of iU at all times unless otherwise drafted by official staff at iU. This article was first published here on 30th January 2016.